We present an experimental prototype that aims to study the use of aesthetics-related features from visual and auditory domains to express a set of 13 emotions. In the visual domain features are unfolded with a chance of occurring according to their perceptual relevance, whereas in the auditory domain there is a previous categorization of emotions. In the end this will result in a series of digital abstract faces expressing certain emotional states. It is known that several visual aspects may influence the induction of emotions. For instance, brighter colors have been linked to positive emotions, whereas darker colors have been linked to negative emotions . Other associations have been studied by Cavanaugh . 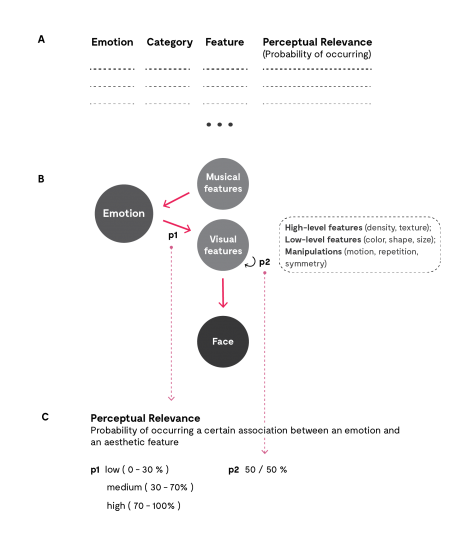 Understanding how to evoke a certain emotion through sound  and image  is a crucial point for the development of design artefacts based on non-verbal communication. Nevertheless, this issue is still largely unexplored by design sciences. We argue that the expression and communication between these seemingly distinct domains is easier and more comprehensible through the development of a perceptually relevant aesthetical language. (A)The process of building a perceptual alphabet (B); how it is represented, and (C) How probabilities decide facial elements or specific attributes. P1 — general probability of a certain feature being associated to an emotion; P2 — probability of two or more features of the same type being chosen among themselves. The visual alphabet was composed by high-level features (density, texture, complexity), low-level features (shape, size, color), and manipulations (motion, repetition, symmetry). Inspired by Chernoff faces  (see Fig. 2) modularity and nature, we generated several digital faces with properties guided by our previously mentioned visual alphabet. 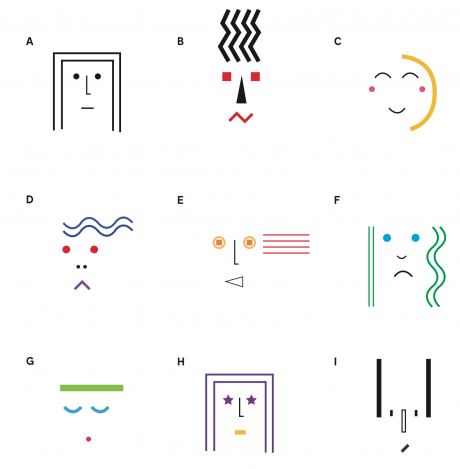 Example of Chernoff faces. Image rights belong to . Music was subject to a previous emotion categorization based on the piece character. Some of the facial expressions generated. (A) Initial face (neutral); (B) Anger; (C) Happiness; (D) Fear; (E) Excitement; (F) Sadness; (G) Calm; (H) Dignity; (I) Expectation. Although significant bibliographic research and experimentation has been done in this work, it must be subject to continuous updates in the future. We believe that the use of IEC (Interactive Evolutionary Computation) is important to evaluate the relevance of specific features regarding a specific emotion. Cavanaugh, L. A., MacInnis, D. J., & Weiss, A. M. (2016). Perceptual dimensions differentiate emotions. Cognition and Emotion, 30(8), 1430– 1445.